Number-fact #1: there are 116 champions in League of Legends today, and plenty more to come. Number-fact #2: there are 365 days in a year, and the character models in this four year old game look a little shabbier with each passing one. Consequently, Riot employ a full-time ‘relaunch’ team to tackle every ageing champion in turn, giving each a visible and audible overhaul and releasing them back into their lanes. It’s a process that’s going on all the time. But it’s a little different with Nasus, because his voice actor has passed away. Beyond a higher-fidelity halberd, new animations and a spruced up model that reflects his “unbounded intellect and immense power”, vaguely Anubisian champion Nasus has been newly voiceovered. That’s upset players, some of whom want to honour the work of his original actor, jazz-soul legend Gene McDaniels. McDanielsdied aged 76 in July 2011. 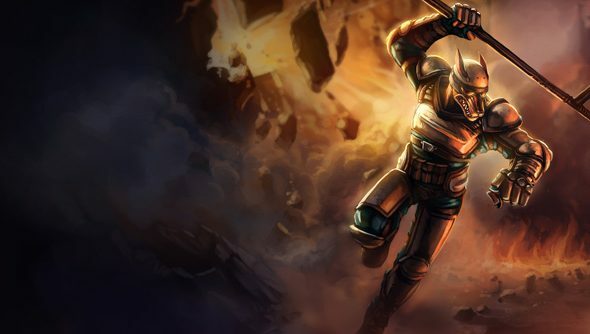 A Riot relaunch QA analyst told players on the official LoL forums that the developers had been “very conscious” of fan feelings while working on the Nasus update, but couldn’t feasibly keep McDaniels’ voice. The great strength of the ever-growing online game is also its curse: nothing can stay the same; everything must be borne forward ceaselessly into the future. Some of you lot must be Nasus players. What’s your take on this?